Social service leaders hope new partnerships lead to stronger neighborhoods. Safe & Sound’s Elena Burke (left), Drug Free Communities manager and Adrian Spencer, District 5 community organizer, listen to a panel of neighborhood organization directors. Photo by Andrea Waxman. Rick Banks, a community organizer at the Harambee Great Neighborhood Initiative, said that connecting with others doing similar work and exploring opportunities for collaboration were the most valuable results of the inaugural Settlement House Neighborhood Summit. “We don’t often get this many people doing community development in the same room at the same time,” said Banks. He held a notebook in which he had listed people and organizations he plans to contact. “If people don’t have housing, they don’t have health and that affects their ability to keep a job,” said Banks, discussing the interconnected problems community developers are addressing. “No one can do this kind of work alone,” he said. “The big takeaway is we have to develop a collective vision and collective action,” to be effective. Tony Shields, executive director of UNCOM, reviews the themes of the summit at the end of the full-day session at Discovery World. Photo by Andrea Waxman. 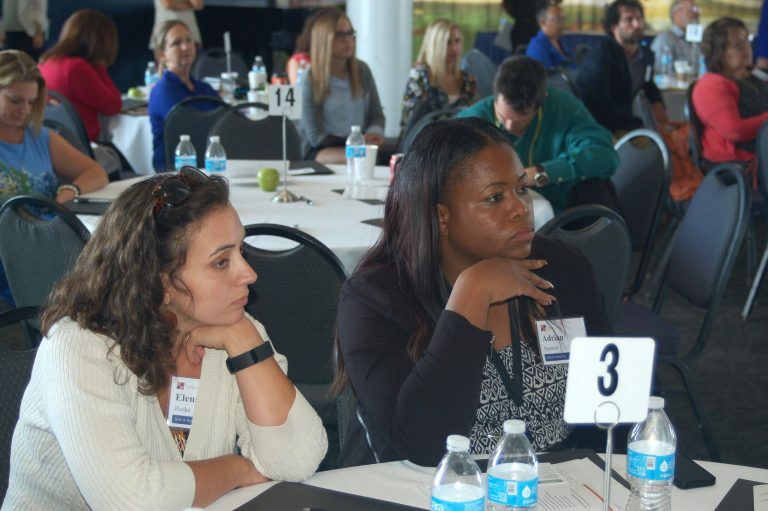 The summit, organized by United Neighborhood Centers of Milwaukee (UNCOM), brought more than 200 people from its member agencies and representatives from community, business, philanthropic, government and health organizations together at Discovery World. Looking at the historic settlement house model, attendees discussed how best to harness their collective power to strengthen city neighborhoods by improving the quality of life for urban families. Settlement houses were first established in England in the late 19thcentury, to help poor urban families meet their basic needs for food, shelter and work, as well as offer education and other enrichment activities, explained Tony Shields, UNCOM’s executive director. In the U.S., settlement houses were established at the turn of the 20th century to help immigrants assimilate into the new society. “Learning English, getting job skills, quality pre-school for little kids, after-school programming to lengthen the school day for older kids, that’s what they were doing in Chicago and New York in the early 1900s. … It’s not that different from what we’re trying to do,” said Jeff Martinka, executive director of Neighborhood House of Milwaukee, 2819 W. Richardson Place. 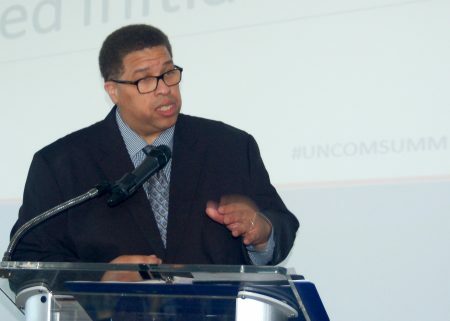 He added that most of the eight UNCOM agencies have the same goal: to provide a large array of services to urban families to help them survive and succeed at every age. UNCOM’s eight member agencies are Agape Community Center, COA Youth & Family Centers, Journey House, Milwaukee Christian Center, Neighborhood House of Milwaukee, Next Door, Northcott Neighborhood House and Silver Spring Neighborhood Center. The summit was underwritten by the Doris Duke Charitable Foundation. Shields asked participants to leave with a new idea for a partnership, a goal and a commitment to return for a second summit next fall. Participants agreed that meeting and hearing from others working on related community development projects gave them new ideas, openings to explore collaborative partnerships and new creative energy. 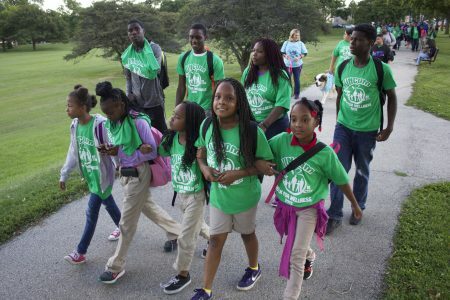 Working in place-based organizations can be lonely, said Karen Higgins, executive director of Milwaukee Christian Center, 807 S. 14th St.
A group of children lead the UNCOM Walk for Wellness to support healthier living, in September 2015. Photo by Emmy A. Yates. Though Martinka said that he and others who helped organize the summit worried about the value of spending a day away from their agencies, their fears proved to be unfounded. “Having people together in this room was worth the re-energizing impact, and I believe … there’s going to be new programming and new partnerships that are going to result from the summit. When Martinka heard about how Pearls for Teen Girls “added muscle” to a peer’s existing teen program, Martinka decided he wants to bring the program to Neighborhood House, he said. Rashad Wahab, community engagement coordinator at Fitzsimonds Boys & Girls Club, 3400 W. North Ave., said he plans to meet with a Marquette University representative who organizes student volunteers. Eric Gass, executive director of Agape Community Center, also left with “plenty of ideas,” including collaborating with Milwaukee Justice Center to help Agape area residents with problems related to drivers licenses. He said he has already contacted the center.